With Old Man Winter knocking on the door, the long sunny days of summer can seem far away. Colder weather settling in around the barn can mean additional considerations when caring for your horse. Here are some guidelines for preparing your horse for winter. 1. To blanket or not to blanket? Most horses in good body condition can grow winter coats that provide enough warmth for temperatures that dip below freezing as long as the pasture has some source of shelter from the wind, rain, and snow. In these cases, most horses do not need an outdoor blanket for warmth. However, this changes if any part of the horse’s coat is clipped for riding. Many riders prefer a clipped or partially clipped horse for riding in the winter. Shaggy winter coats can take a considerable amount of time to dry after even a moderate ride and a horse needs to be properly cooled down to prevent chilling. Clipping decreases cooling time but increases the need for blankets, both in the stall at night and when out on pasture. If you decide to clip your horse for the winter riding season, or if your horse does need some extra protection when out in the field, at the start of cooler weather, have the blankets cleaned. Also make sure they fit properly and are in good repair. It’s easier to fix minor rub spots or torn buckles prior to the onset of nasty weather. As cold, wet weather turns the pastures into mud and snowfields, hay will likely become the primary source of roughage for your horse. As the winter wears on, make sure the hay continues to be of good quality and is not too dusty. An adult horse should consume approximately 1 to 2% of his body weight in roughage per day. For the average-sized horse, that equals about 10 to 20 pounds of hay per day. Winter is probably the most important season to ensure your horse is consuming enough roughage. Some horses will lose weight during the winter due to the extra energy expended to stay warm. If your horse has a tendency to become thin, slowly increasing his daily caloric intake could be beneficial. Easy sources of extra calories include a small top-dress of vegetable oil on your horse’s daily grain. Start with small amounts no more than ¼ cup to prevent diarrhea. If you have to increase the overall amount of grain, consider breaking feeding into three meals to promote easier digestibility. Water intake is the most crucial dietary aspect to monitor in the winter. Preventing water buckets and troughs from freezing is one key preparation to keep in mind. Portable water heaters are easy to install and can help prevent a consequence of inadequate water consumption: impaction colic. Some horses are reluctant to drink cold water. Even if you live where the temperature doesn’t get below freezing, offering warmer water during the winter can encourage drinking. Occasional bran mashes or adding some warm water to your horse’s daily grain ration can also help keep him hydrated. Maintaining barn ventilation is important in the cold, dry winter months. A closed barn causes ammonia fumes to build up in stalls and constant exposure to these fumes can cause problems with your horse’s respiratory tract. Dust, too, can accumulate if windows and aisle doors are not left open at least part of the day to adequately bring in fresh air. Pasture management is a challenge in the winter as run-off collects and freezes in low-lying areas. Common areas in a field that can become particular boggy include the gate area and around the water trough. Churned up mud can freeze and quickly become jagged with icy edges, leading to treacherous ground for horse and human alike. Sometimes loose gravel in high-traffic muddy areas can help disperse some of the mud. If possible, periodically moving the water or hay trough can also help preserve footing and avoid bog formation. Wet snow and muddy pastures can be hard on a horse’s hooves. Although it’s true that hooves grow slower in the colder months, regular hoof trims should still be done during the winter. 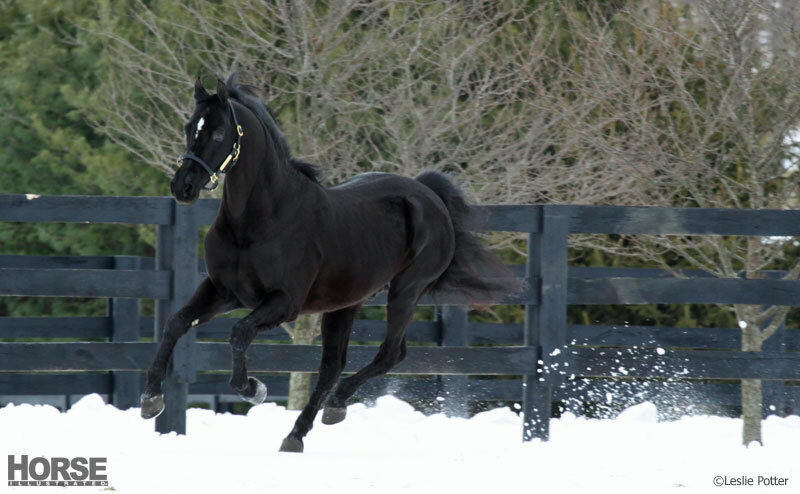 Some horse owners choose to pull their horses’ shoes in the winter to prevent slipping on ice and snow. Frequent hoof cleanings are necessary to remove packed mud and manure in the deep recesses of the sole. Hoof and lower leg maladies such as thrush and pastern dermatitis are common in the winter when horses are constantly standing in wet pastures. Try to keep your horse’s hooves as dry and clean as possible in the winter. Senior equines seem to suffer the most during the winter. Most of this is related to an older horse’s likelihood for poor dentition. If you have an older horse, consider having a dental exam and float performed in the fall, prior to cold weather. For horses with missing or extremely worn teeth, be aware that their efficiency at consuming calories is greatly decreased. Add to this a decreased metabolism and it’s no wonder our senior equines commonly lose weight during the winter. Increasing grain rations and blanketing are two ways to help your senior horse keep weight on during the winter. Consider taking body weight measurements with a weight tape every month to accurately gauge your horse’s body condition. Regular grooming helps get your hands on your horse and is another way to assess body condition, especially if your older horse grows a shaggy winter coat that potentially hides boniness. Vigorous grooming also acts as physical therapy by warming up the major muscle groups. This can make your older horse feel better during the winter, as colder weather can cause arthritic joints to be especially stiff and achy. Colder weather brings some unique challenges to horse care. With a little bit of preparation, the winter season can be pleasant for both you and your horse.